The number of potholes repaired by councils in England and Wales rose by more than one-fifth last year. Some 330,000 more potholes were filled than in 2017/18, with spending on roads maintenance up 20%, a study says. However, the Asphalt Industry Alliance annual survey suggests much of the £24.5m was spent on short-term "patch and mend" work to 1.86 million holes. 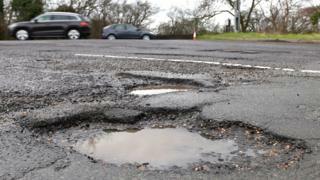 "Faced with severe financial pressures, councils have managed to spend more on road repairs in the past year in order to fix a pothole every 17 seconds," said Martin Tett, transport spokesman for the body which represents councils. Why do we have so many potholes? However, the AIA says the responses of local authorities to its survey revealed a "big discrepancy" in spending on roads between different councils. AIA chairman Rick Green said: "Sustained investment over a longer time frame is needed if we want a local road network that supports enhanced mobility, connectivity and productivity." AA president Edmund King said the survey suggested the country was "beginning to find its way out of the rut". "Increased funding and a milder winter presents an opportunity to begin to catch up on the backlog - but any slackening off will simply pitch our roads back into a deep hole," he said. A Department for Transport spokesman said: "Potholes are a huge problem for all road users and the government is taking action, providing local authorities with more than £6.6bn for roads maintenance and pothole repair in the six years to 2021." Video Potholes: Why do we have so many of them?